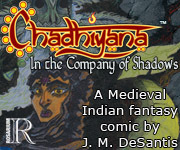 Chadhiyana.com | Boston Comic Con 2014 is One Month Away! Boston Comic Con 2014 is One Month Away! 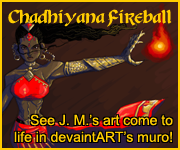 Boston Comic Con begins exactly one month from today, and amongst its many distinguished guests is, Chadhiyana creator, J. M. DeSantis. This is his first convention appearance since debuting Chadhiyana: In the Company of Shadows at the New York Comic Con (October 2013)! (For information on his short hiatus from public appearances, refer to his blog on jmdesantis.com, specifically these two entries: A Word About Conventions and Shows in 2014 & Upcoming Cons & a Happy 4th of July.) So mark your calendars for August 8-10, and don’t miss out on the other appearances he has scheduled for this year. If you don’t live in the Boston area or aren’t attending the Boston Comic Con, there’s the Baltimore Comic-Con in September (5th-7th) and then the New York Comic Con again in October (9th-12th). Other than that, J. M. DeSantis does not have any other shows scheduled (for his overseas and Canadian fans, he hopes you can make the trip out for one of these); however, he is open to suggestions. If you know of any good conventions you think J. M. DeSantis might be interested in, please do mention them in the comments section below, and J. M. DeSantis will (honestly) see what he can do about exhibiting at them either this year or next. Also, you don’t have to wait for an announcement in this blog or his website’s blog to know about upcoming events. You can always keep up with J. M. DeSantis’s public appearances (conventions and otherwise) on the Events & Shows page of his website: jmdesantis.com/events.html (always kept up-to-date). For more information on the Boston Comic Con visit bostoncomiccon.com.